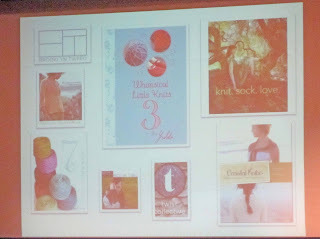 I had the pleasure of attending the February Madison Knitter’s Guild meeting where Clara Parkes was the guest speaker.You may be familiar with Clara’s blog Knitter’s Review or one of her fabulous books in The Knitter’s Book of… series (we carry all 3 books here at Firefly Fibers). Her most recent book is The Knitter’s Book of Socks in which she thoroughly covers the fundamentals of creating the perfect pair of socks – elasticity, strength, and moisture management. 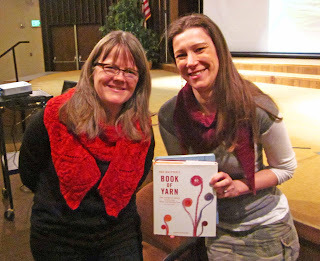 Knitter’s Review and her books are essentials for the curious fiber enthusiast, regardless of skill level. Clara launched Knitter’s Review in 2000 as a source for honest reviews on yarns, tools, books and more.This was before Ravelry - can you even remember a time before Ravelry?! With over a decade of reviews, there’s a very good chance you’ll find one on what you’re looking for. I did some digging in the archives and found a review of our beloved Blue Sky Alpacas Sport Weight here from 2003. I was smiling and nodding in agreement while reading Clara’s step-by-step analysis of this yarn. Blue Sky Alpacas has grown quite a bit since then and the yarn is now presented in a hank rather than the pesky center-pull skein she speaks of - other than these minor details, this review is just as relevant in 2012 as it was all those years ago. Clara shared how the internet has recreated the fiber landscape - the days of print magazines and books as the main source of showcasing designers has come to an end. 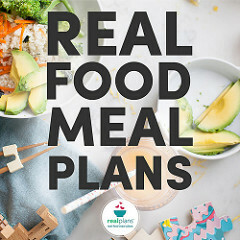 In the light of the digital age we are seeing changes in how people connect with each other and how we share and receive our information. Through Ravelry, Etsy, the blogosphere and other social medias, the internet has given way to a multitude of venues for yarn and pattern designers to showcase their work. It’s rather exciting! Each of us has a vote and we cast this vote when we purchase patterns by independent designers on Ravelry or at our LYS.Clara spoke of the good professional patterns that are available to us and how the independent designers that provide quality can rise to the top via the democracy of Ravelry. Through Ravelry and the self-publishing of patterns, these designers can be fairly compensated for their hard work and it’s wonderful to see them make a living while following their dream. Clara was gracious enough to sign my books and have a photo snapped with me before the meeting started.Thank you Clara! 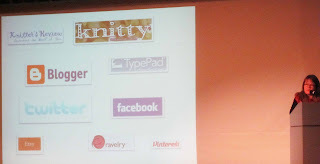 Madison Knitter’s Guild is one of the largest knitting guilds in the country with over 550 members varying in skill levels from beginner to expert.MKG currently meets September through May with a nationally recognized designers, authors, and teachers speaking at the meetings about, what else, knitting!